I hope I'm not standing on John Cox's toes here - his website The Book Bond is always first to break details about new James Bond covers. 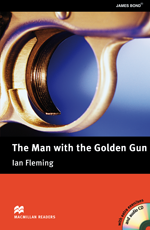 However here's the first image I've seen of "The Man With The Golden Gun" from the new Macmillan Readers titles for 2013. Note: Macmillan Readers are a series of ESL (English Second Language) books. I don't believe the book has been released yet, but when it is I'll be adding it to my collection of Macmillan Readers series.